Little Yellow is one of those annoying sulphur types. The Little Yellow (Pyrisitia lisa) is considered to be one of the more abundant yellow sulphur in any area that it occupies. If you’re seeing small yellows and sulphurs bouncing around you’re probably running across this guy. I am fairly certain I have seen them in many areas, but the only place I was able to capture and document one was at Idywild Wildlife Management Area, and that is the photo above. There’s definitely a chance I had been out on other expeditions and saw a Little Yellow, but had already snapped photos of another yellow and said to myself, “bah I already got that guy.” But I have since learned that is you have the space just shoot shoot shoot – especially when you’re dealing with species like yellows and sulphurs that can look so similar. The Little Yellow is very little – I know, shocking! – but it’s like really little and almost impossible to nab with its wings open. At rest, the wings are pretty much perminently closed. 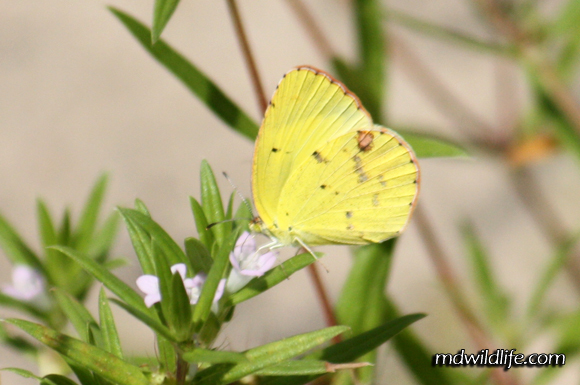 To distinguish the Little Yellow from other sulphurs you may see in Maryland, look for the adundance of wing spots, including two very far down the wing and close to the head. The pink “eyespot” is also very different from other area sulphurs in that it rarely has any white in the middle and is not accompanied but a smaller spot.